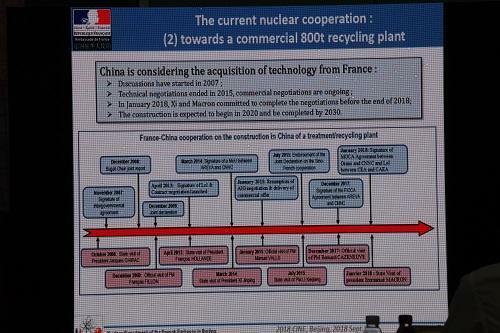 Speaking at the 2018 CINE Forum held in Beijing in September 2018, Christophe Poinssot, CEA representative at the French Embassy in China, said that while France and China are sill discussing commercial aspects of the agreement to build a 800 tHM/year reprocessing plant in China, the plan agreed on in January 2018 calls for completion of the negotiations by the end of 2018. The construction work is expected to begin in 2020 and the plant will be completed in 2030. In June 2018 Orano and CNNC began preparatory work related to the project.